This is the end of our series on nudges and choice architecture – we started with an introduction to the concept in episode 35 and have worked our way through all the aspects of the NUDGES acronym: incentives, understanding mapping, defaults, giving feedback, expecting error and now wrapping it up with structuring complex choices. Be sure and download your free worksheets on all of the aspects of nudges by becoming a subscriber. 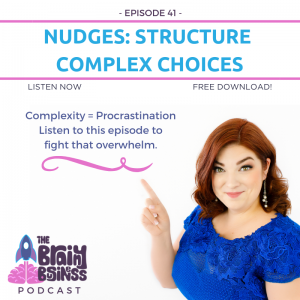 In this behavioral economics podcast, I talk about structuring complex choices. I also revisit mapping and the five steps to understanding mapping, because it is the foundation of complex choices. This episode is also our final application of the air conditioning example. I also dig into several other examples to illustrate this concept and how it all ties into ways to make your business better. [02:41] Mapping is the foundation for complex choices. Thaler and Sunstein describe a mapping as “the relation between choice and welfare” and use a simple example of choosing a flavor of ice cream. [03:16] Some tasks like choosing an ice cream flavor are easy. Others are more difficult. The path from the choice to the outcome is called a mapping. [04:25] The task of the choice architect (that’s you) is to set up a system that helps make the map as clear and easy to use as possible. [04:37] The five steps I created and identified in understanding mapping were: 1) encourage thoughtful review and open-mindedness, 2) break it down, 3) make it relatable, 4) help them get there and 5) call to action. [05:12] When you get into a more complex choice, there is a need for filtering and removing options. [07:12] The compensatory strategy works for easier choices or choices with less options, but not with more complex choices. Instead, you need what is called elimination by aspects. [07:32] By choosing a few aspects that matter, you use those to narrow the field. [08:47] When you eliminate everything over a certain arbitrary line, you could miss something that is just outside the parameters. This is the risk we take with elimination by aspects and the constant battle of complex choices. 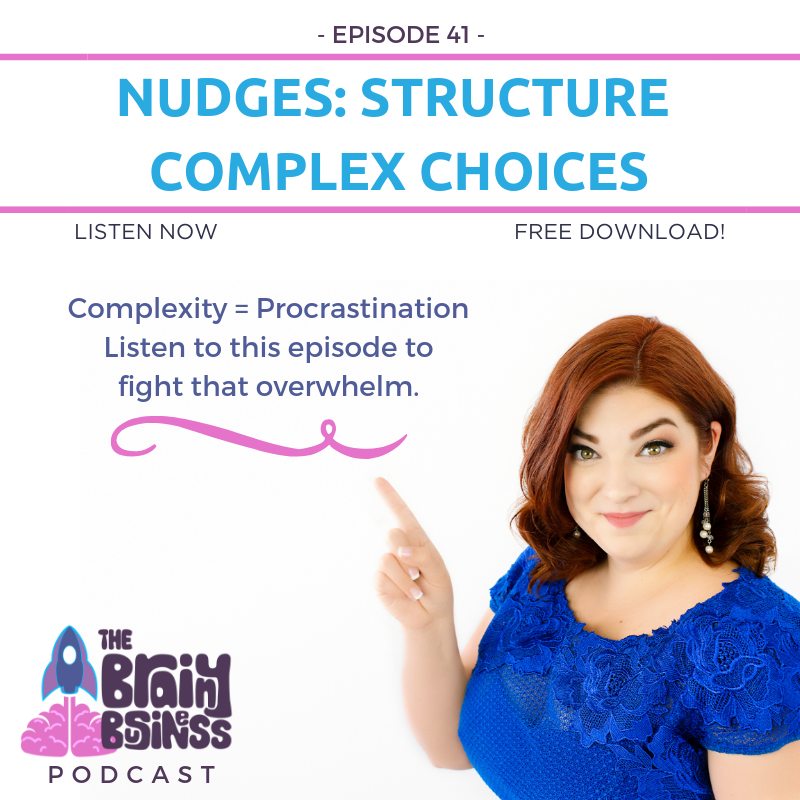 [09:25] The internet has given us tons of resources to help simplify our complex choices. [09:57] A presort can help us when looking at a menu. This way we can eliminate the options that we don’t care about. [11:20] When people are presented with too many options they don’t buy. We get overwhelmed with too many choices. [14:16] We only see a lot of choices as a benefit when they are properly handled such as going to a toast restaurant with all of the spreads and toppings categorized. [14:52] Cold Stone Creamery uses a form of anchoring and adjustment to help with their complex choice options. [15:41] Showing how aspects can come together can help people make a more complex choice. It can help them eliminate things they know they don’t want when they are properly categorized. When looking at your own business, it is important to recognize if you have an inherently complex choice or if you are needlessly creating a complex choice. [15:50] The final air conditioning example. Complex choices can be made unnecessarily complex. Our AC choice became more complex because we needed to upgrade the heater. [18:34] It’s important to present the options in a way that doesn’t talk you or your customer out of business. [19:06] Don’t be afraid of silence with complex choices, because people need time to process. [19:25] Using behavioral economics in business is much more than messaging, branding, sales, or any single aspect. To incorporate it properly, it’s important to know all of the concepts and how they work together. [21:40] A paint color example where using swatches makes the color choice much easier than names or numbers. [23:50] A fun exercise where I give names of companies and how their methods could be applied to your business. [24:03] This technique will help you shake things up and get out of your comfort zone. [25:09] An example using The Knotted Wood. [25:48] Try to look at the cursory decision and ask if you are trying to solve the problem in the right way. [26:00] Companies that do a great job structuring complex choices. [30:17] Remember to think about ways you can reduce complexity as well as how you might add complexity to your business. [30:41] Seven episodes felt like a TON to put into a series, so thank you for those of you who have tuned in for the whole thing – and for letting me know how much you enjoyed it. [31:08] All businesses are based on choice. It’s your job to structure those choices in the best way possible, using a map so the customers know what is in their best interest, aligning the incentives to set up a default – and give feedback along the way for all those errors you expect people to make.